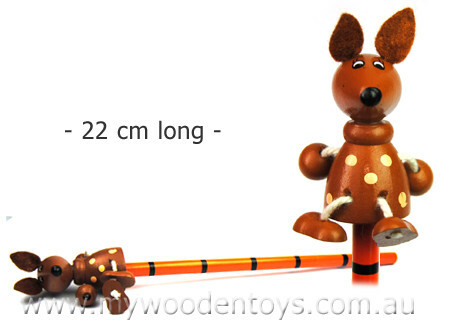 Kangaroo Wooden Pencil is a sweet wooden pencil with a kangaroo attached to the top. This pencil is grey and the brown kangaroo has spots and a beautiful pair of felt ears. The pencil body is orange with black stripes. The kangaroo has arms and legs attached with soft cotton string. The painted eye detail is complete with eye lashes. We like this because: "Lovely painted black nose."